1305280261 -Streamlined and up to date with the latest research and developments from the field, bestselling COMMUNICATING FOR RESULTS: A GUIDE FOR BUSINESS AND THE PROFESSIONS, 11th Edition, introduces students to the basic concepts and techniques needed to successfully communicate in today’s business world. 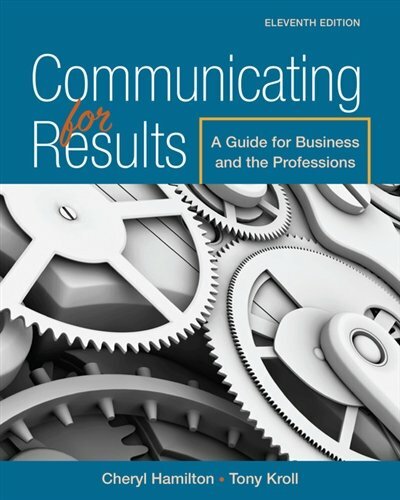 Covering every aspect of the communication process — from organizational approaches to culturally aware interpersonal communication obstacles and strategies for critical listening and improved use of social media — Hamilton’s text gives students a competitive edge in interviews, presentations, future leadership roles, and more. Online video clips of common professional scenarios help students apply chapter concepts to real-world practice, while Polishing Your Career Skills features provides diagnostic tools to help them sharpen their own skills. In addition, MindTap Communication provides an interactive learning solution that engages students and improves outcomes.